News and research in housing and urban policy, from Australia’s leading urban policy research centre. 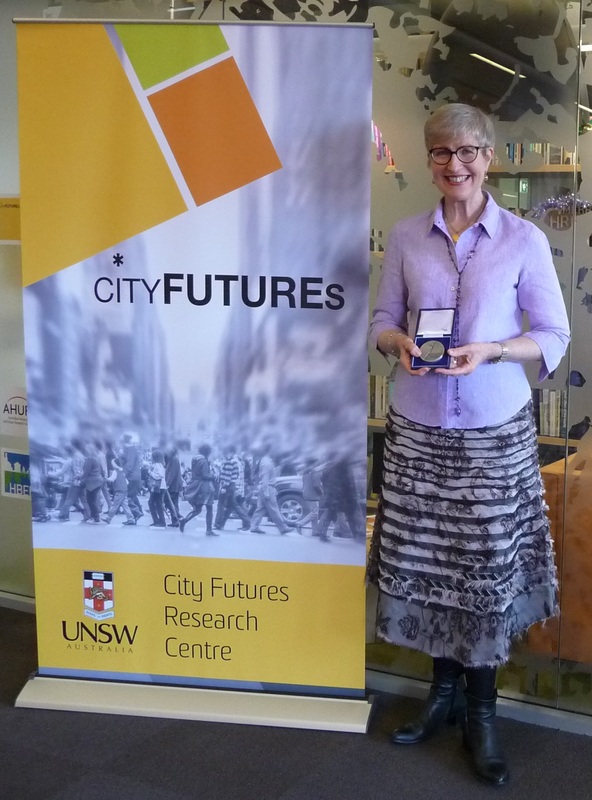 Congratulations from everyone at City Futures to our colleague Professor Susan Thompson, who has been awarded the Sidney Luker Medal by the Planning Institute of Australia. Susan’s work is all about healthy planning. In her acceptance speech for the award (extracted below), she looked back on where her work has come from, and where it may be headed. It is an incredible honour to be the 2015 Sidney Luker Memorial Medal recipient. I am deeply humbled that my work as a planner is considered to merit this important accolade, especially when I look at the calibre of past awardees. I hope you will forgive a little reflection, but I would like to say a few words about some of the key influences that have shaped and focused my planning career, and to make one or two comments about where things might be heading. My planning career is grounded in local government – where place making for community happens – and where some of the most important healthy planning can also occur. My planning career started in local government in the late ‘70s at South Sydney Council. I then moved to Canterbury Council, where I spent over a decade learning the ropes in both strategic and statutory planning. Canterbury is also where I saw first-hand how planning needs to respond appropriately to cultural diversity and difference. That theme of cultural diversity has been one of the defining cornerstones of my planning career. I then had a relatively short stint in the NSW Department of Environment and Planning, started at UNSW in 1991. Next year will be my 25th at the University. I am very proud and privileged that I have been able to make a contribution to the education of planners in NSW and beyond – teaching in one of Australia’s top planning schools. I have also been very fortunate to have had some great opportunities to undertake research on issues that I believe are important to bring to planning practice. Understanding cultural diversity, and the subsequent development of appropriate practice, has been one of those issues. And of course, so has healthy planning. I was certainly in the right place at the right time to embrace a resurgence of interest in this field. In the early 2000s there was a growing interest in the relationship between health and planning particularly as governments started to worry about escalating health costs associated with chronic, lifestyle related diseases. To be fair, healthy planning wasn’t new – health professionals were well ahead of many of us in appreciating the role that our physical, social and cultural environments play in influencing our health. But planning wasn’t always separated from health – and tonight it is fitting, as we remember the legacy of Sidney Luker and the County of Cumberland Plan, to recall that the promotion of good health was an underpinning objective of that iconic Plan. We are now re-acknowledging the close relationship between planning and health – and the critical part that the built environment plays in supporting health and wellbeing as part of daily life. Progressing healthy planning has been a remarkable experience and a great privilege. In many ways, this work represents the pinnacle of my planning career. It has given me the opportunity to bring my research, teaching and practice together in unparalleled ways, helping the planning profession recognise the positive opportunity that healthy planning affords. I have met, and now work closely with, some of the most inspired and passionate advocates for public health in Australia – my colleagues at the Heart Foundation, PCAL and NSW Health. Indeed, it was the NSW Ministry of Health that funded the CFRC in my Faculty to establish the Healthy Built Environments Program back in 2010. This was an important catalyst for healthy planning in NSW and we have come a long way. There have been many achievements – our research has influenced policy at the Federal level (here I am referring to the work of the Major Cities Unit in the Department of Infrastructure and Regional Development). We have influenced key policies and strategies coming out of NSW Health and the Department of Planning. I am particularly excited about the possibilities for the Healthy Planning Expert Working Group in determining healthy planning criteria under the auspices of the current Metropolitan Plan for Sydney. And we have helped to shape planning legislation – seeing for the first time in Australia, an objective to protect human health in a planning bill (the NSW Planning Bill 2013). I am especially proud of the healthy built environments column in the Planning Institute’s ‘New Planner’. Since 2010 I have been writing that column with a health colleague. And here I acknowledge the support of Robyn Vincin – then Executive Officer of NSW PIA – in supporting this initiative. For the last 2 years I have co-authored the column with Peter McCue, Executive Officer of PCAL. The ‘New Planner’ column is for me the epitome of one of the most important things I do as an academic – getting the message to practitioners where it really matters and can make a difference. I am also gratified that I’ve been a part of one of the key planning texts here in Australia – ‘Planning Australia’ (the first planning text published in 30 years when it first appeared in the book stores). Now in its 2nd edition, it has an entire chapter on healthy planning. Together, with my healthy planning colleagues, I think we can say that healthy planning is now seen as mainstream for today’s urban planners. And that makes me very proud to be a 21st Century Australian planner. We have to ensure that we provide a healthy city for everyone – especially for those dependent on others – children, the elderly and those with disabilities. We need to ask: Is the healthy city culturally appropriate? Are its benefits available to those who cannot pay the full price for new infrastructure and proximity to quality open space? And while denser cities can offer more opportunities for walking, cycling, and less need for cars, we have to ensure that the neighbourhood context is supportive of health. Do residents have close by and easy-to-access services, retail and employment opportunities? Is there sufficient, good quality green space for everyone to be able to get to? Are the streets lively and safe? Are we densifying some of our cities too quickly and with little thought for the communities who are already there? Are we ignoring regional growth opportunities with our focus on the city and the urban? Are we missing other possibilities to accommodate population growth in health supportive environments? And how do we maintain and strengthen political support for healthy planning? So still a lot for us to do! What if autonomous vehicles actually make us more dependent on cars?